In the late 1980s a local airport located in Plainville, Connecticut decided to expand its runway. Building the extension required the filling of four acres of wetlands along the Pequabuck River, which runs through several towns in the area, including Farmington. This, unfortunately, would destroy a major portion of a vital wetland area. 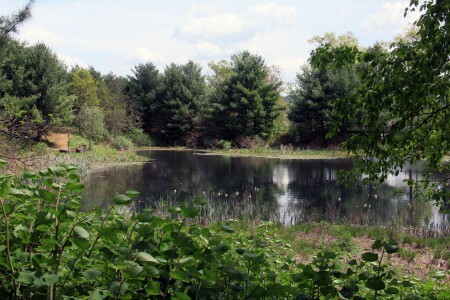 To mitigate the loss of the wetlands, the town of Plainville turned an adjacent sand pit into a four-acre wetland by meticulously removing the wetland soil, vegetation, and animals from the construction site and transporting them to the current location in the nature park. To say that the area survived all of this and thrives to this day would be an understatement. There is an abundance of wildlife living in Tomasso Nature Park: the eastern painted turtle, common snapping turtle, northern water snake, great blue heron, Canada goose, northern rough-winged swallow, raccoon, white-tailed deer, muskrat, and more. 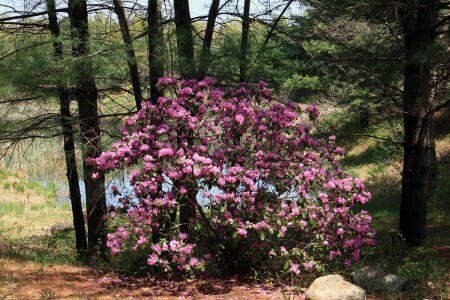 The park is also filled with a wide variety of vegetation common to a healthy wetland area. Footbridges were built to help visitors cross streams and wet areas. Plenty of benches and large rocks are available to visitors while exploring the park. My first visit to this park was in November last year, two days after the park had been closed for the winter. I returned early in March when it reopened, but the snow and cold of Connecticut’s long winter made exploration difficult. Also, to reach the park I had to walk down a paved path alongside a fenced hazardous waste area on one side and a housing complex on the other. This short walk made me wonder if a nature park could really exist in an area like this. However, I returned in warmer weather a few weeks later to find high grasses and wildflowers swaying in a gentle breeze and dozens of painted turtles sunning themselves on rocks, lily pads, and stumps in man-made ponds. As I walked down the short entry road, several swift-flying birds caught my eye, as they as they seemed to vanish into a sand-like embankment near the waste dump. 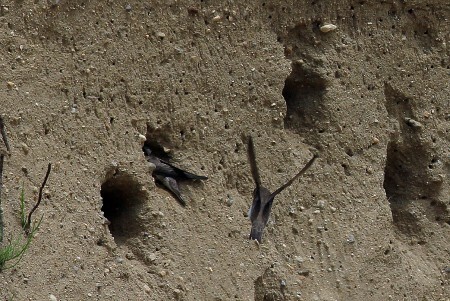 Later I discovered that they are rough-winged swallows tending their nests dug tunneled into the sand bank. I knew then that this park was going to be a rewarding discovery. After entering Tomasso Nature Park, it took me only 20 minutes walking at a comfortable pace to go completely around the park. But this walk could have easily taken much longer had I paused to enjoy the many varieties of birds and other wildlife moving freely around the park. Another feature that I liked was the absence of crowds that I often find in other nature areas. I could actually hear and identify several different bird calls during my short walk. When I returned home after my last visit to the park, I called my daughter Sarah and shared my experience with her. She suggested that we visit the park with Mom on Mother’s Day if the weather was nice. My wife, Tricia, has an arthritic condition that is sometimes aggravated in cold weather, and this past winter made some days very uncomfortable her. She likes to walk with me when I visit parks, but not during the winter cold. 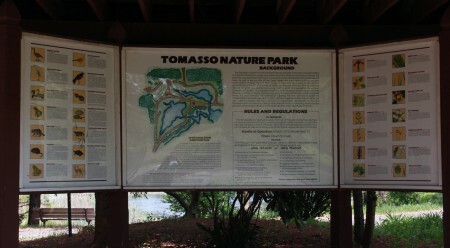 The visit to Tomasso Nature Park would be her first of the warm weather season. Below: Sarah and Mom enjoying the scenery and warmth of the sun. Tomasso Park’s crab apple trees were in bloom. 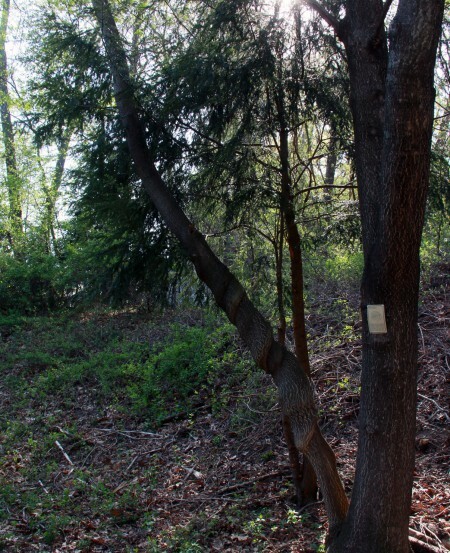 All of the interesting or unusual trees in the park have identification tags. 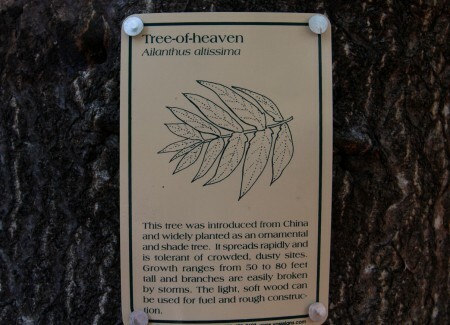 This Tree-of-Heaven is our favorite. 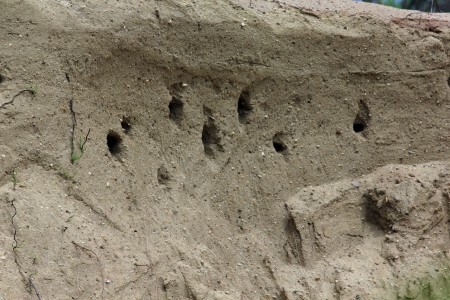 Below is the swallow nesting area located near the entrance to the park. Rough-winged swallows were tending their nests. 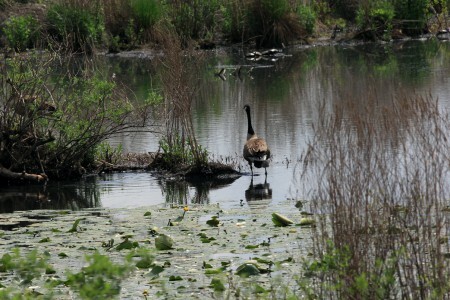 It would not be a wetland area without Canada geese. Sarah and Mom are both teachers in a local school system. As we left the park, they promised to return again and bring some of their students back on a nature walk. This year, Mother’s Day was a huge success.